Juliette is a damaged girl. She's been cooped up in this psych ward/jailhouse for just about a year and she hasn't seen or touched anyone in a while. List time she did touch someone, that person died, and she's almost content to live a life where she won't have to hurt anyone ever again. She's never had somebody love her, and somewhere deep, deep, deep inside of her, she craves it. But she can't have that love when she's a monster. Lemme just say right off the bat here that Mafi's writing was spectacular. I soaked up each and every single word, basking in the wonderful glow of all the similes and metaphors and whatnot. The only author that rivals her technique would be Lauren Oliver, I think. I've never read something so deep before. If there was a reading geek heaven, Mafi's writing would be it. The only think that irked me would be how she didn't write out the numbers. For example, instead of one, it was 1. It wasn't that big of a problem that I wanted to toss the book aside; it just rubbed me the wrong way a little. There was plenty of action and adventure tied in with lies and mysteries that left me going 'Yes, yes, yes, yes, yes . . .'. I tore through all the pages. I wanted to know what would happen. I wanted to devour it. Adam, I thought was so badass, a lot of the time, rocking his tattoos and shooting off his gun occasionally. Speaking of Adam, I'd like to talk a little about the romance and such of this book. Alright, it was absolutely adorable, okay? Just, met-your-heart adorable. Adam was so sweet and he just swooped and made Juliette realize she isn't that monster she thought herself to be. Sadly, I felt like it just happened too fast. It was one of those inst-love situations that bugged me a little bit. Instantly, they were devoted to one another and all mushy, touchy-feely. Also, I was a little disappointed with Adam. Here I thought that he was going to be some really hot guy, completely irresistible. But, I, for some strange reason, wasn't attracted to him. 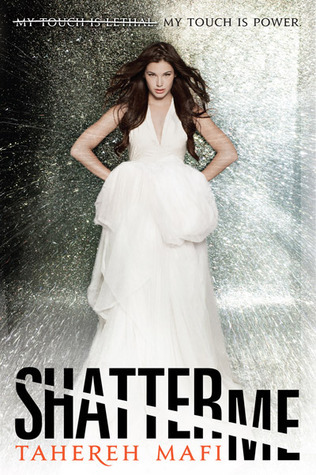 Shatter Me is a book of self-discovery. It's a book of the impossible love and a world built around an evil society. I traveled along this journey that Juliette took, getting all depressed when she cried, my heart beating faster when she was in an adrenaline-filled situation. It was beautiful. I'm not sure what else I can say about the writing because there just aren't that many words to describe it's intricate beauty. If you haven't picked up this book yet, I hope you do because it certainly has made one of my top favorites for 2012. I'm glad to see that you loved this book so much Millie! I, unfortunately, didn't love it as much as you did. It's so nice that Monica sent you her copy! She's so sweet, isn't she? ;) Anyways, I got kind of irked my Mafi's writing at times, but I must admit, it was really gorgeous. I prefer Lauren Oliver's writing though, because it's more simplistic. I got a bit overwhelmed with all the repeating words and cross outs in this book. I thought the romance was sweet too, but agree that it was definitely insta-love.